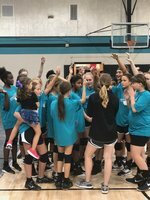 Volleyball tryouts for the 2019 season are April 23rd - April 26th at Discovery Middle School. All girls must have a current physical to tryout. This form can be found on DMS's website under the Athletics tab. Click 'required physical form'. I look forward to seeing you at tryouts!